Because “duck, duck, goose” is a little too wintry (at least in the Northern Hemisphere) for a post written in the dog days of August. In Australia, ornithologists have finally gotten their hands on a Night Parrot, the first such capture in more than 100 years. The bird is so rare and elusive that it was thought to be extinct. 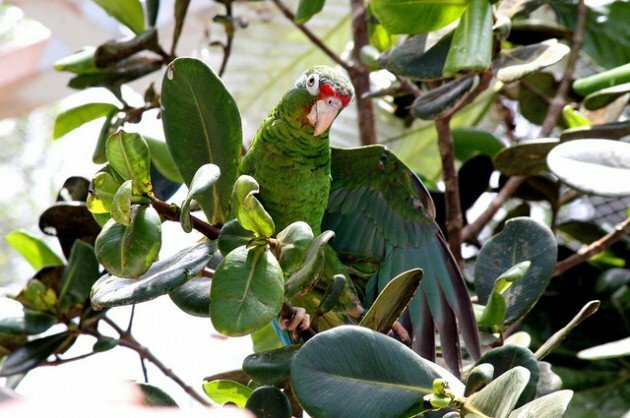 By tagging the Parrot and monitoring the area with remote cameras, scientists hope to learn more about this species and how to keep it safe. If you follow baseball, you’ve probably heard of the “rally squirrel” and the infamous “rally monkey.” Finally, avians have earned their place as a good-luck charm: At least one member of the New York Mets credits their recent success, at least in part, to a parakeet that’s been spotted around Citi Field as of late. Outfielder Yoenis Cespedes, a recent addition to the team, was in a slump until the bird’s arrival; after donning a neon yellow sleeve in solidarity with the brightly colored parakeet, he belted his first home run as a Met. Rally Parakeet FTW! And if your life list includes Bahama Woodstar, you might want to get back out into the field. Scientists have gathered evidence in favor of a split, naming the Inaguan Lyretail as a separate species, due to differences in vocalization, physique, and behavior, confirmed by genetic studies. Researchers are planning to ask the American Ornithologists’ Union to make the split official.